People often ask me, why do you call yourself “Warrior Jase”? Given the current trend of adopting a nom de plume that is both aspirational and inspirational for social media, I chose “Warrior Jase” for both of those reasons. It’s certainly not who I think I AM per se, but in my personal Yoga journey, I’m learning to refine my warrior-like qualities. So this begs the question – what is a Warrior? Warrior means so many things to different cultures, races and creeds. In ancient Māori context, a warrior was revered for his fierce, fighting prowess on the battlefield – whether it be between tribes or against the colonialists or ‘pākeha. There was immense ‘mana’ attached to battles won and warriors were remembered down the ages through word of mouth. Stories of mighty warriors Te Rauparaha and Maui, are retold as part of our Kiwi heritage. In more modern times, the 28th Māori Batallion were remembered as the fiercest fighters arguably of any culture, to fight in the Second World War. Similarly, Ancient Indian philosophies share myths of brave warriors much like the Māori of old. The Bhagavad Gita speaks of the Archer Arjuna, known for his pinpoint accuracy with his bow and arrow. Virabhadrasana meaning ‘Heroes friend’ was famous for battling Shakti’s father Daksha when Shiva heard of his love’s death. Virabhadrasana was created from a lock of Shiva’s hair. The creation of an Ancient Yogic Warrior and the beginning of other warriors to come! No matter what definition or which figurehead resonates with you, the attributes of a warrior are always the same! One who is strong of body but calm of mind in battle… One who is fierce and peaceful all at the same time… One who has the strength and courage to lead an army of men, but the vulnerability to face the demons that come from the pillages of war. Simply put, to me a warrior is the perfect embodiment of sthira and sukkha – strength and softness. My yogic practice of meditation and pranayama has allowed me to find the softness that comes from stilling the mind and moving beyond my identity of self. When we turn our outlook in, we are able to move past ‘what’ we think we are (our physicality) and start the journey towards ‘who’ we actually are. Warrior One Asana is the perfect example of effort (physically) and ease (of breath, drishti and attitude). That is, strength and softness in balance. Well, it’s taken me 41 years to realise that I am more than my strong supple body! I can do a solid ‘Warrior 1/2/and 3’ on my yoga mat… But my practice is teaching me that there is more to yoga than just physical endeavour. The peace and calmness of mind it takes to stay, breathe and ‘be’, rather than ‘do’, is a life-long journey that calls on warrior-like qualities. A journey that I humbly accept! Warrior by name… and hopefully, eventually; Warrior by nature. Jase is a Kiwi Warrior. 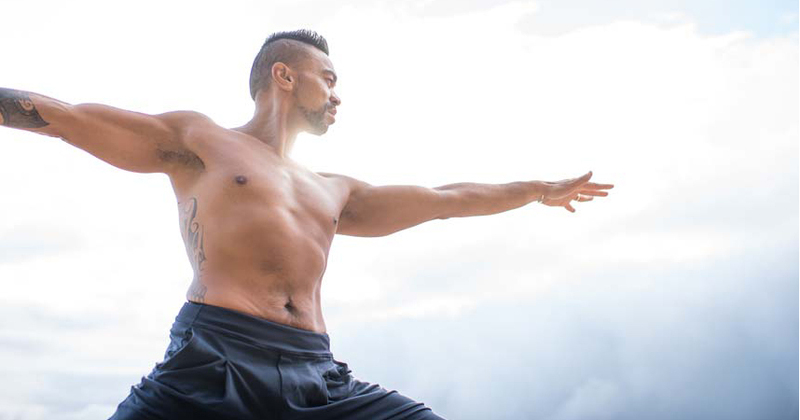 His journey to Yoga came from an injury whilst dancing in South Africa. A lifetime of performing in shows around the world, most recently Disney’s The Lion King, has led to a huge transformation through the discovery of Yoga. A 12-year practice of asana and meditation led Jase to his Teacher Training with Power Living in 2012, since then his life has been completely transformed! Jase is highly passionate about his never-ending journey of self-discovery, both on and off the mat. He is equally stoked to be able to share all the gems he has learnt throughout his Yoga travels!